TropiZen, one of Puerto Rico’s first licensed cultivators and manufacturers of medical cannabis, is working around the clock to open their facility after the recent string of hurricanes impacted the Island. TropiZen remains confident in their ability to open their facility before the end of the year. 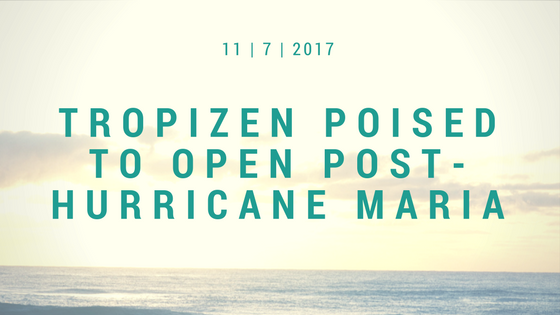 “We understand the difficulties faced by Puerto Rico and the Puerto Rican community from the storms,” said Jay Meistrell, Founder and CEO of TropiZen. “As a result, we are doing everything we can to open our doors at a time where even the most basic of needs are challenging.” The Tropizen facility was largely undamaged during the storms and is pending final certifications and immediate opening upon their receipt. The hurricanes’ impact has been felt by the fledgling marijuana industry as a whole. Lack of electricity, storm damage and flooding has resulted in near-total crop loss. Although Mother Nature has setback the Puerto Rican marijuana business approximately six months, the good news is that twenty of the twenty-nine dispensaries on the Island remain open. Life, in general, has changed since Hurricane Maria and while estimates say 80% of Puerto Ricans are without power, companies like TropiZen are doing everything they can to help bring normalcy back to the Island. As jobs are lost and generator prices are skyrocketing, Puerto Rico’s people remain committed to shining once again. Since Puerto Rico, which recently legalized medical marijuana, felt the brunt of the hurricanes, the government has prioritized the cannabis industry. Cannabis is viewed as a way to help those in medical need with chronic conditions, and also a way to create new jobs to help bring the Island back from a decades-long recession. Legislators have temporarily waived a restriction requiring patients fill their prescription at one designated dispensary. In addition, the requirement of notarized paperwork to obtain a patient card was lifted. Renewals of patient cards and occupational licenses were also extended. Encanna, Tropizen’s subsidiary, produces the purest, freshest medicinal cannabis products, including oils and tinctures, cartridges and edibles, made from traditional Puerto Rican recipes.